In my last post, I said I could now disassemble and assemble a foot pump in a flash. I was wrong. I should have said that "I can now destroy a pump pretty damn fast!" In case you didn't read my last post (and I don't blame you because it's really boring), I fixed the foot water pump...sort of...it started working again but leaked like a waterfall. I took it apart again, so fast and easily that it didn't satisfy the mechanic's itch. The diaphragms "seemed" a bit loose so I disassemble them too. Then I tightened them real good, so good one split open. It's fixed for ever and an eon. 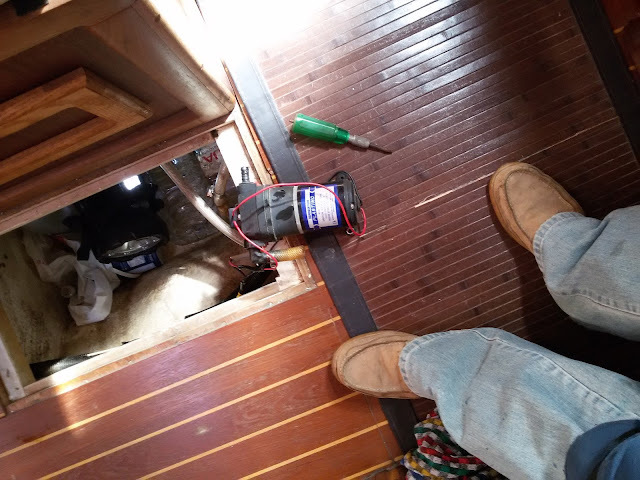 My boat is naked, but I cannot live without a galley water pump, gotta have at least one. My next victim was the electric water pump which I haven't used in years. Why? Because I ruined the pressure switch by running the tap with just a dribble to save water. Which means the switch kept going on and off like a machine gun. And, yes, I confess, it was the second pump I dispatched in that manner (fools never learn). Not finding a switch for sale, I bought a new pump. Those were the days I was still making good money. 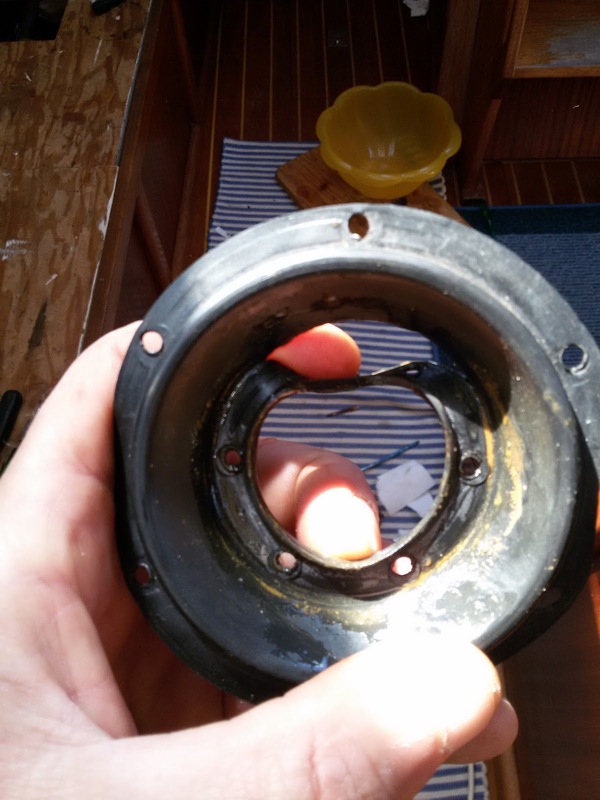 Removed the Plastimo water pump from the bilge. It was pumping great when I last used it about 6 years ago. Now the pump part is full of crud and won't spin. The motor spins like it was new. I placed it in a small container, poured vinegar to cover the bottom cruddy part and let it soak for a few days. After all that work and after washing the dishes from lunch by pouring water from a jug (highly ineffective and messy), I went for a stroll around the marina. 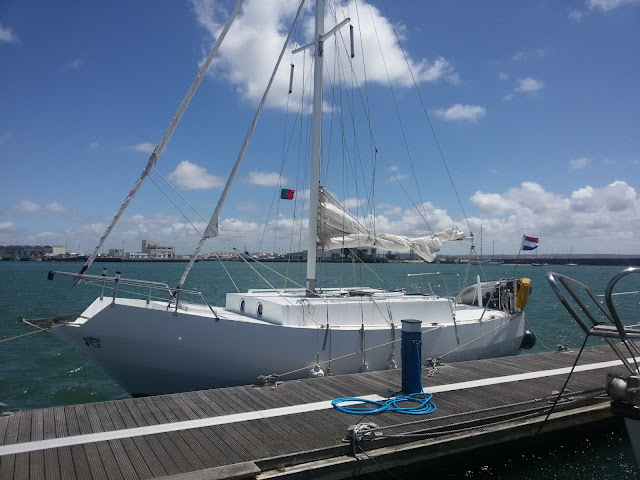 An acquaintance of mine stopped over on his way to the Algarve on a replica of Slocum's Spray, which he built himself out of plywood in record time. 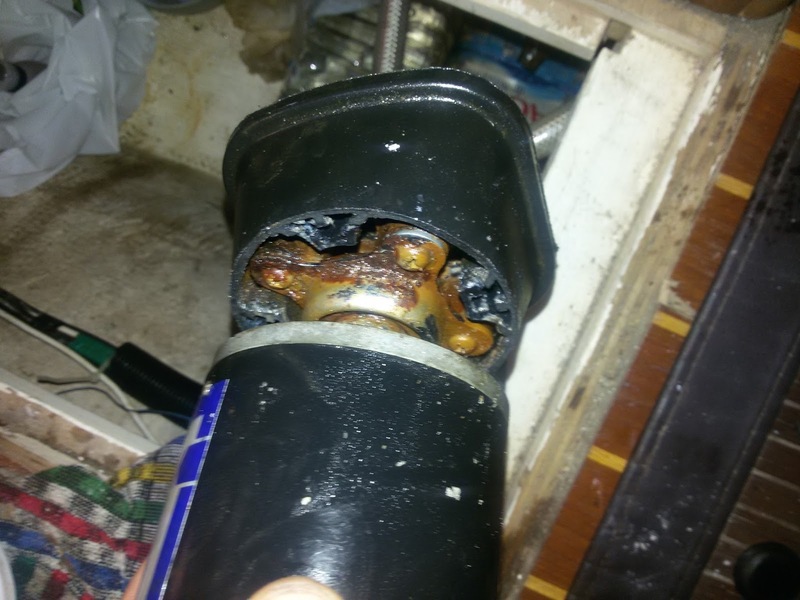 The vinegar dissolved most of the crud and the motor worked perfectly. But when I attached the pump section, it just stuck. A little grunt and nothing more. I hit it repeatedly with a rubber mallet, swore, threatened it with fierce-looking vice-grips. Nothing. Merda! Back at home, a Youtube video taught me that the bearing is seized. OK, so now I know how it works, which was beyond my comprehension. No, I'm not going to buy a new bearing. I think I'll just scratch my head for a while. I think I still have the original electric pump in a plastic bag some place in the garage. How many parts does a water foot pump have? Way too many. Plus, I forgot to take pictures during the disassembly process and got confused about how the four valves are set up. Staring at the pump's schematic drawing in Nigel Calder's boat maintenance book only made me more befuddled. Finally, I applied some basic logic and even laughed out loud on realising how simple it really was. There it is, ready for operation. I discovered a sliver of wood in one of the valves, which explains why it went from working perfectly to suddenly being hard to pump and producing tiny squirts of water. How a small sliver of wood got into the water tank is a mystery. Now it pumps great, but leaks like the devil. Either I didn't tighten it enough or a seal didn't seat the way it should. 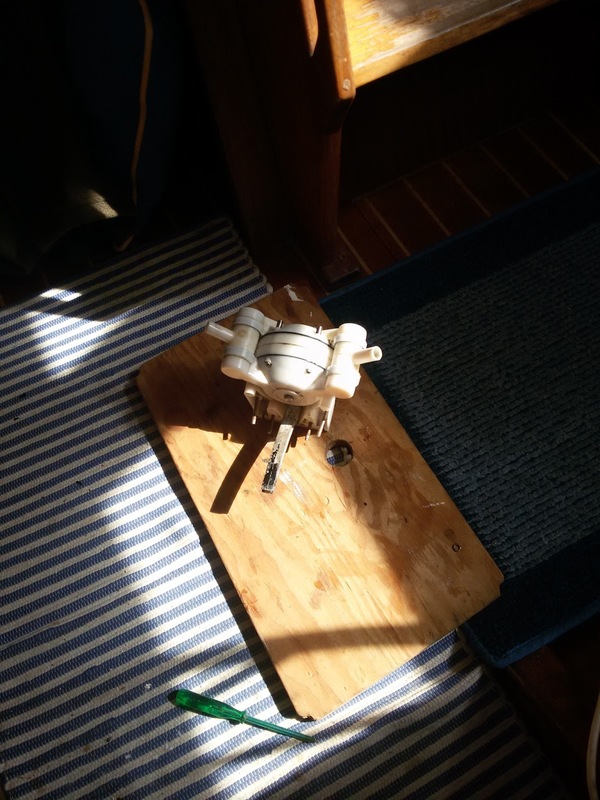 The good news is that I can now take it apart and reassemble it in a flash, compared with the 2.5-hour struggle the first time around. Finished just in time for lunch. 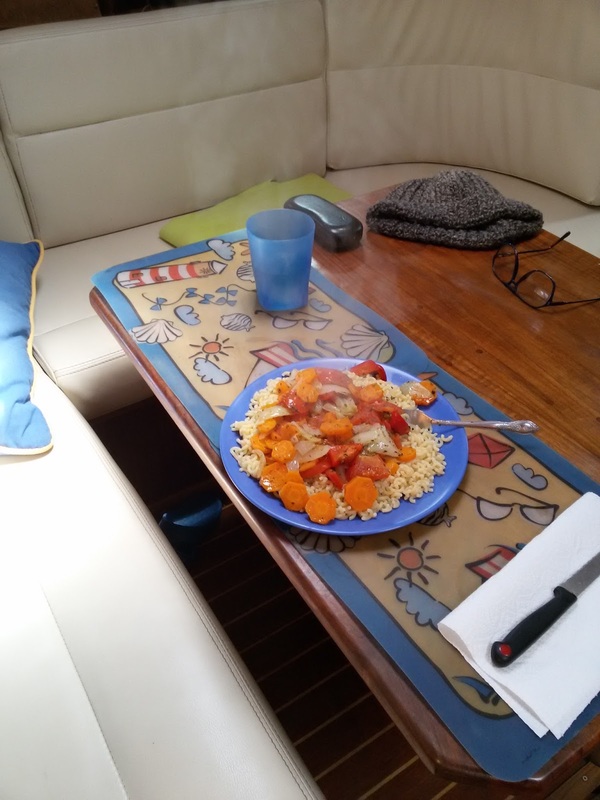 Cooked up my famous vegetable stew over pasta. No meat, no fish, no wine, just hunger and food. I've gone from 94 kg to 87 kg in 2 years. Slowly but surely. No magic trick, merely a bit less food and more exercise. The finish line is 85 kg. At 1.85 m tall, that sounds reasonable to me. Still steaming and mighty delicious! 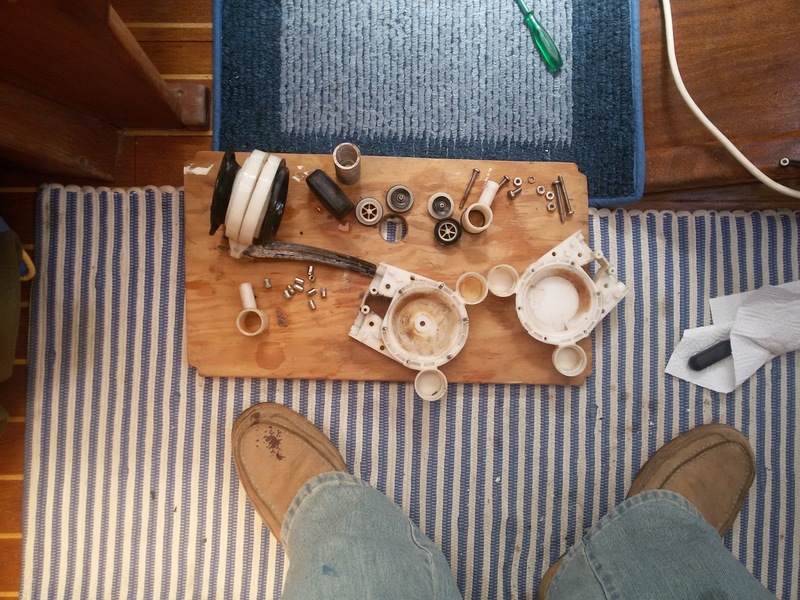 After walking around the marina with a big cup of coffee talking to other boaters, I tackled the battery project. 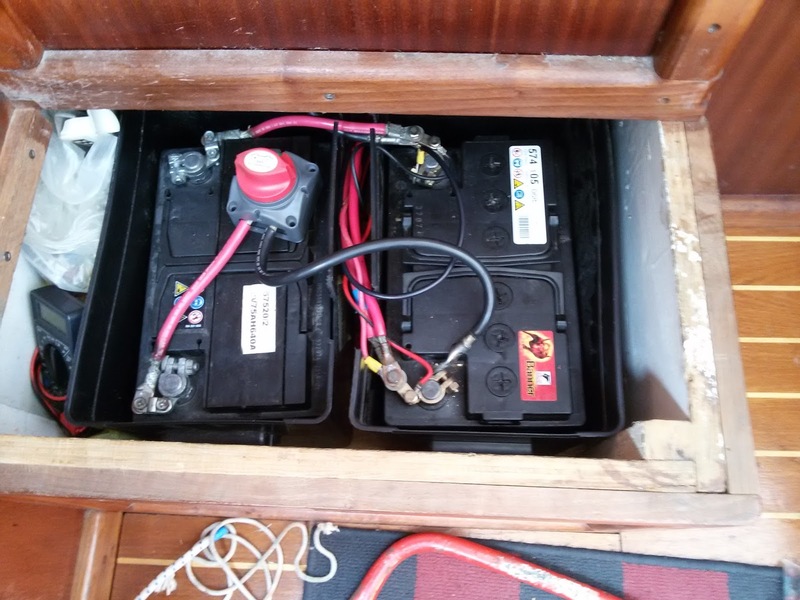 My big Varta 180 AH (200 euros) house battery died last year at anchor in Culatra (after 8 years in service and one successful resuscitation). It was paralleled with the old engine battery which, in addition to being old, only has about 75 amp hours. Since my jeep died a couple of weeks ago (overheated), I decided to add its battery to the bank. I also recovered the battery boxes from my ocean-crossing days that used to contain expensive deep cycle batteries, which died early anyway. When you have a wind generator or solar panel - especially with a modern regulator that will keep batteries ship-shape through an equalising, float and boost program - there's no need for expensive deep cycle batteries. Any run-of-the-mill battery will last a long time if you don't overload it.